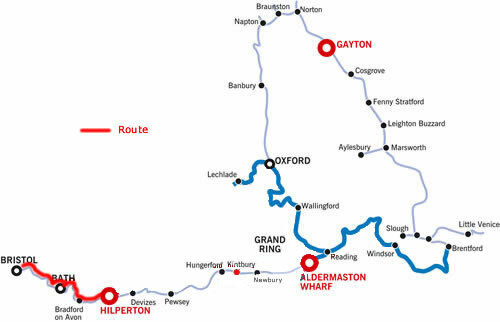 25 hours cruising would elsewhere be considered little more than a short break, but here the route includes Bradford on Avon, Bath, Bristol and many more towns and villages that the canal passes through the centre of. Having followed the route of the River Avon by canal, after Bath the navigation uses the River itself, reverting to canal to divert into Bristol city centre. This cruise cannot be undertaken if the River Avon is in flood. Varied and delightful shops and restaurants line Bradford on Avon's narrow streets made all the more glorious with multi-coloured hanging flower baskets. Some stunning weirs accompany each river lock down to Bristol. Museums and waterside features reflect the city's former importance as a sea port, and frequent reminders of the route's industrial history such as the brass mill at Kelston are found within rolling valley countryside. Bath and the surrounding area is brimming with things to see and do. Designated by UNESCO as a World Heritage Site, Bath presents some of the finest architectural sights in Europe such as the Royal Crescent, the Circus and Pulteney Bridge, alongside a diverse collection of museums and attractions including the Roman baths, Jane Austen centre and Thermae Bath Spa. Bath's compact city centre offers irresistible shopping and there are plenty of activities to enjoy in the surrounding area, and Bath is worthy of at least a couple of days of exploration. to Hilperton Road bridge 166, there is a convenient stores here. You are also on the outskirts of the delightful town of Trowbridge, the county town of Wiltshire, it is one of the three largest towns in Wiltshire. Just an hour from Hilperton you reach the medieval town of Bradford on Avon . Here you will come across your first lock. With good moorings below the lock (and a choice of canalside hostelries) you can walk up to the lock and watch a few boats go through to gain confidence before you go through yourself. Being a wide beam canal, the locks take two narrowboats, so you can share the experience, and effort, with another boat. It is 1 hourscruising from Hilperton to here so an ideal place for your 1st night. Bradford on Avon to the North of the canal, is a lovely town, one of the beauty spots of Wiltshire, and one of the highlights of the Canal. It is a miniature Bath, rich with architectural treasures from the Saxon period to the 19th Century. Bradford upper Wharf is very attractive, with a small dock with some of its original buildings still standing, and an old canal pub by the lock. The town centre is very compact, you can walk down the hill from the Canal wharf. There is also a swimming pool near the canal. The Great Tithe barn stands below the canal embankment and is one of the finest in the UK, dating from the 14th century with a massive cathedral like structure. The splendid 9 arch Town Bridge is very unusual as it has a chapel in the middle, dating from medieval times, but used during the 17th & 18th centuries as the town prison. Westwood manor lies 1 mile south west of Bradford on Avon, a 15th C stone manor house open through the National Trust. The River Avon rushes along beside the canal, Avoncliff is a nice place to stop with its tearoom and pub overlooking the river. On approaching the Avoncliff aqueduct, please sound your horn and approach bends with caution. Further along, if you moor at Limpley Stoke Bridge, walk down the the Railway bridge & turn left you will find a lovely 400 year old Pub called the Hop Pole, which was originally a monks wine lodge. After crossing Dundas Aqueduct you will see a restored ¼ mile section of the old Somerset Coal Canal, the canal collected coal from 30 collieries throughout the 19th C.
The Dundas Aqueduct was built in 1804 and is one of the most well known features of the canal. It is best viewed from the valley below to appreciate its full beauty and architecture. West of Claverton Road bridge is the American Museum in Britain, housed in a manor built in 1820. The museum houses American decorative arts from the late 17C to the mid 19C. Claverton Pumping station to the east of the canal has a waterwheel pump which is the only one of its kind on British canals. The pumping station is run by volunteers and is open every weekend during the season. Bathampton & Bathwick are on the outskirts of Bath there are moorings at Bathampton- east of the swing bridge & opposite the playing fields & also by the George Inn which is Canalside . There are also moorings at Darlington Wharf which might be less busy than above the Bath Locks. The easiest access to Bath is to moor up at the top of the Bath Lock, mooring here puts you in line with the rooftops of the city and an enjoyable walk away from the city centre. There are useful shops to the west of bridge 188. When the River Avon is in flood the Bath Locks will be locked. Cruising into Bath is like gliding into Regency Britain. A few locks onwards and moorings are available very close to the city centre; Bath has much to explore and plenty of good places to eat. All the locks are accompanied by weirs so great care should be taken, and allow for the river current, and when mooring allow a slack on the lines. There are good moorings by Churchill Rd bridges, convenient for a supermarket. Also by Broad Quay. You can spend the day exploring Bath. Bath was first developed as a spa town by the Romans because if its natural warm springs. There are extensive Roman buildings to be seen, the Roman Baths are in the heart of the city which is a World heritage Site. The fantastic sweeping architecture of the Royal Crescent built around 1770 and the Circus which dates from 1760 have to be seen. In the Royal Crescent is the Jane Austen centre- a tribute to Bath\\\'s famous resident. The Thermae Bath Spa the only place in the UK where you can bathe in natural warm waters. Bath Abbey in also in the centre of the city, it was established in 1499, and is famous for its fan vaulted ceiling, also it has interesting memorials to the vast range of people who in times gone by have died in Bath. Leaving the city centre you go through Weston Lock and you soon reach the outskirts of Saltford. Best access for visiting the town is by Kelston Lock where mooring is possible. The Riverside Inn is Canalside and the Jolly sailor by Saltford lock. You can get supplies in the town. There are pastures flanking both sides of the canal now as you go past the small village of Swineford where there is another lock. The Swan Inn is near the lock.This stretch of the river is a favourite to many people whether boaters or not. The Avon valley Adventure & Wildlife park is beside the river off to the left just past Bitton railway bridge 211. See their website -www.avonvalleycountrypark.com. This is a tourist attraction for all the family, there is so much to see and do, the park covers 50 acres of beautiful country side adjoining the River Avon, there is a huge amount of activities for the children including 5 big slides, a big outdoor adventure play area and undercover play area for wet days also a 1 ¼ mile junior assault course. Something for every age, train and tractor rides, fishing, pets corner, electric quad bikes and dizzy duck rides, falconry, mini-golf, boating and pedal go-karts. The Park is usually open for the season from March 31st. When cruising downstream and approaching Keynsham just prior to the bend it is advisable to sound your horn. This will warn craft who may be leaving Portavon Marina of your approach. Proceed with care along this stretch. Keynsham is handy as there are plentiful moorings and shops to stock up on for the continuing journey. Access is near Bridge 214 near Keynsham lock, the pub here is called the Lock-Keeper. Soon enough the lock at Hanham is upon you, there are mooring facilities for thirsty boaters nearby at the lock. There are 2 riverside pubs- The Lock & Weir & Chequers & both have moorings for patrons. Hanham marks the end of British waterways jurisdiction & the River Avon is usually only tidal beyond Hanham, but high spring tides can reach as far as Keynsham lock. Upstream craft should give way to downstream craft on fast flowing river sections. The Lock keeper will give you advice about where to moor in the Harbour, but it is a good idea to ring ahead of your visit. Do not moor between Hanham & Netham locks as it is tidal. After Hanham lock the views are still pleasant as you start to cruise through Bristol's suburbs. At Netham the river goes away to your left, you steer a course right through Netham Lock which is where you get your licence, see above. You are now in the heart of Bristol, with all the hustle & bustle of the boats around you as you would expect. Bristol is steeped in maritime history , and there is a pleasing combination of old and new quays, some dating back to the 13th century, and a contrasting selection of bridges. There is no shortage of moorings here, alongside sea going vessels modern and old alike such as the SS Great Britain or land locked sights such as the cathedral or Bristol’s expansive shopping facilities are all within reach for those on foot. 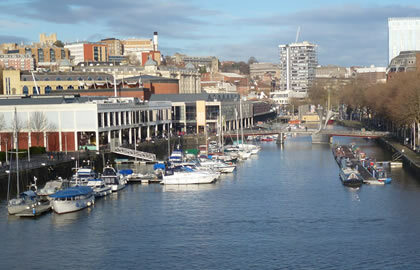 It is just over 8 hours cruising from Bath Top lock to the Lloyds Amphitheatre in Bristol Harbour. The non-tidal floating harbour is a central point of Bristol’s maritime facilities, built in the 19th century to make it easier for the loading and unloading of cargo, it serves just as well now to make an easy and convenient launch pad into the city. There are great views of Clifton Suspension Bridge- the world famous bridge and the iconic symbol of Bristol, designed by Isambard Kingdom Brunel in 1831 and completed in 1864 after his death. There is much to see & do in Bristol & of course fantastic shopping opportunities, and much of it within walking distance from the harbour. The M Shed is very prominent in the floating harbour near the vast old cranes. M Shed is an exciting and innovative new flagship museum for Bristol with gallery space and a packed events schedule & its free!! Also in the harbour is Brunel's SS Great Britain an Award-winning attraction showing the world's first great ocean liner and National Brunel Archive, voted UK Large Visitor Attraction of the Year. Be amazed by the sumptuous surrounds of the First Class Dining Saloon, once admired by Queen Victoria! Scramble into the cramped bunks in Steerage! Take a whiff of the smells, from gorgeous freshly baked bread to vomit, and search out the talking toilet! Discover the true story of Victorian passengers and crew on a super-speedy two-month voyage to Australia (twice as fast as a sailing ship!). This iconic steam ship, and national treasure, was designed by Isambard Kingdom Brunel, and lies at the heart of a multi award-winning visitor attraction. Also close to the harbour is AT-BRISTOL, a state-of-the-art, interactive science centre, offering an amazing world of hands-on discovery for you, your friends and your family. At-Bristol involves people of all ages in an incredible journey through the workings of the world around us. Plus there is always something new to discover with At-Bristol's programme of special exhibitions, from animation to flight and illusions to water! The chrome-plated, futuristic sphere in Millennium Square is where you'll find the Planetarium, where you can sit back and take a trip to the stars beneath an immersive domed screen in the seasonal star show, which is just one of many brilliant attractions housed within At-Bristol. The spectacular Bristol Aquarium in Bristol's historic Harbourside area takes you and your family and friends on a spectacular undersea safari. Bristol Aquarium showcases native and tropical marine and freshwater creatures from around the world in naturally-themed habitats, all designed to inspire deeper understanding and appreciation of the natural world. In the city of Bristol also well worth a visit in Queens Street you will find Bristol Museum & Art Gallery which tells the story of our world in every display, from the beginning of time to the present day.19 galleries over 3 floors reveal fascinating cultures, ancient civilisations, human invention and creativity, as well as showcasing our beautiful and fragile natural world. With thousands of amazing objects on display,one visit just isn't enough! A bus ride away is Bristol Zoo , in Clifton. A visit to Bristol Zoo Gardens is an adventure into an exciting animal kingdom, all set within 12 acres of beautiful gardens. Visitors will come face to face with over 400 species of exotic, endangered and adorable animals from the four corners of the globe. Visitors to Bristol Zoo can see the family of gorillas, including gorilla baby, Kukeña, stroll through the tropical Butterfly Forest or become immersed in the impressive Seal and Penguin Coast. Some other Zoo favourites include Monkey Jungle, Reptile house, Asiatic lions, Bug World, Twilight World, and the Aquarium. For shopping follow the signs to Cabot circus which is a is a gigantic three-tiered shopping and leisure centre, which provides city centre visitors with over 120 shops including 15 major flagship stores and signature stores Harvey Nichols and House of Fraser. Located in the heart of Bristol alongside Cabot Circus is The Galleries, an attractive, three-storey shopping centre, which is home to Boots, WH Smith, TK Maxx and a further 100 stores. Cabot circus is also adjacent to Broadmead which has over 300 stores and a fantastic range of places to eat and drink. The newly-transformed pedestrianised streets offer a great environment in which to shop, and relaxing open spaces in which to watch the world go by. It is 12.5 hours back to Hilperton, so see the sights of Bristol & then take a leisurely 2 days cruise, or stop for longer in Bristol.